Если вдруг понадобилась скверночешуя, Влажночешуйчатый пожиратель идеален. Их там дохрена, и плотность заселения высокая. то с 20 мобов 1 шкура то 3 подряд. Рандом он такой стрёмный...но всё же это лучший вариант фарма скверночешуи. Снимал с Камнекожий вепрьв Острогорье.Довольно плотная населенность.С гильдейским бонусом снималось до 5 скверночешуи с 1 нпс если учесть,что шанс дропа шкуры с данного нпс 20%,то где-то за 1 час нафармил 28 "шкур". Оба варианта, предложенных выше мне крайне не понравились. 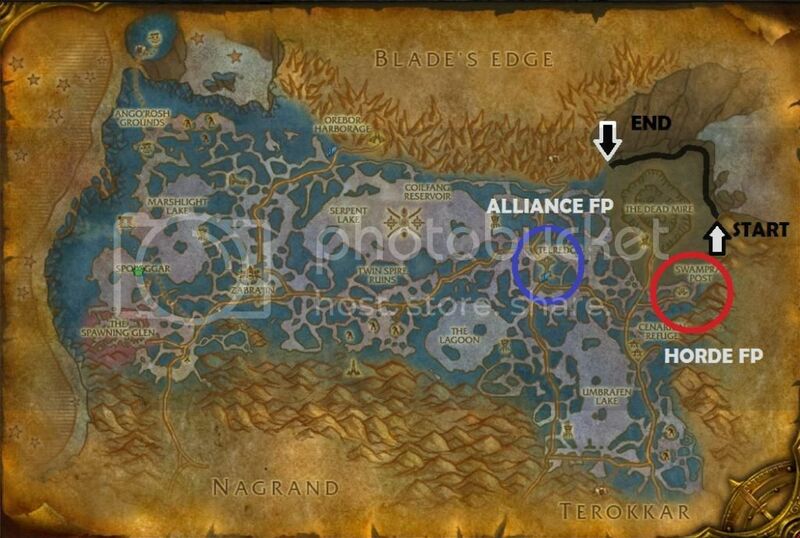 The best place to farm these fel scales are the Quillfang Ravagers and Skitterers. Very easy to kill and about 20% drop chance. Estimated 25 per hour. Either I've been very very unlucky, or they've changed the droprates tremendously. I've been killing Quillfang and Thornfang in Hellfire Peninsula, of those two I had best droprate from the Thornfang, but nowhere near 20%. It takes me less than 30 seconds to kill one and move on to the next one. With looting and skinning I'll be nice and say I take 1 minute per kill+loot+skin (I'd estimate it more to 30-45 seconds). I've killed them non-stop for approx. 3 hours at one go and 4 hours another go. Total those 7 hours netted me barely 50 Fel Scales. If droprate were 20% I should have gotten 80+ Fell Scales (7 hours, 1 skin per minute = 7*60 = 420 skins * 0.20 = 84 Fel Scales). And I'm even being generous, because I skin more than 1 per minute. When not using mana shots, only Kill Command when critting, it takes me less than 45 seconds to kill and skin the mob, and that is where I am not sending pet after the next mob while skinning the current kill). When farming I always let pet eat away on the next mob while skinning my latest kill, and I use Steady Shot a lot between Auto Shots, so this decreases the average time per skin to approx. 40 seconds (again I'm generous). Taking those numbers intead would increase the number of skins to 560 ((7*60*60)/45). I then tried the basilisk in Zangarmarsh, after reading the stats here at WoWHead. After killing 30 of them and I didn't get a single Fel Scale, I moved away from them again. To summarize: I'm horde on EU-Balnazzar, for me the drop rate were a measly ~9% from Quillfang/Thornfang in Hellfire. I had most luck with Fel Scales from Thornfang, but a lot more flesh from Quillfang. The Ironspine basilisk in Zangarmarsh didn't give any at all. Whether you farm ravagers or basilisks for these should largely depend on which type of food you'd rather have after a long grinding session. If you're a melee class or a hunter who wants attack power, go for the ravagers. If you're a spell damage class, basilisks are better. Alot of people in other sites suggested the Shard-Hide Boars of Blades Edge, I think they 86'd that in the 2.4 patch. As many as I killed, one should have dropped them from what the others quoted. Edit: original link I put in was from a different post. My apologies, comfortablynumb. I farm here and the skitterers in HFP as I can fly back and forth between the two areas fairly easily (and enjoy a scenery change from time to time whilst farming). I need 13 of those scales for shadow res gear so I'm gonna try theses, thx for the tip. Can confirm: Dampscale Basilisks near 40% drop. 15-20 minutes, 17 scales. Silmyr Lake in Terokkar. The Quillfang Ravagers also dropps Crystal Infused Leather which can be used later in the LW business! You can find a lot of different Basilisks dropping Fel Scales along the western edge of Zangarmarsh, starting at around the same height as Sporeggar and going all the way up till the ogre encampment. Unlike on other places like Sylmir Lake in Terrokar, I never had to wait for respawns. i got all the Fel Scales i need for leveling LW from 340 to 350 (about 28) in less then an hour. The basilisks in Terrokar are simply the way to go - so easy to kill, so many of them so close together, they drop fel scales as well as crystal infused leather. Can't see why you'd want to fly all the way up to Blade's Edge. I tried both the boars and basilisks to get my scales for LW 340-350, the boars are better imo just because they drop more knothide leather, which you're going to need too after all. The basilisks usually only drop scraps. PS. If you're levelling a hunter or shaman, don't be too quick to get rid of all that crystal-infused leather. The Felstalker and Netherfury crafted gear, when socketed with cheap wotlk blue gems, is as good as anything you'll find in Northrend until the mid-70's. I've had no luck with the boars and fel scale so far. yes! in 30 minutes 7 Fel Scales " the Quillfang Ravagers and Skitterers "
There are also basalisks that line the mountains in terokkar. I've tried to Quillfang and killed like 10 of them only got 1 felscale. But the Ironspine Basilisks in Zangarmarsh had much higher drop rate. I chose to farm here since they were so easy to group up as a 72 hunter. Also, the higher the level the mob is, the more likely it'll drop Knothide Leather. I found the Thornfang Venomspitters and the Thornfang Ravagers at Thornfang Hill (approx. coords 10,50) in Hellfire to have a solid drop rate. As an 81 hunter, I worked a semi-circular path around their spawn points and ended up with 30 Fel Scales in about 40 minutes. Aside from the scales, the skinning was mostly scraps with a few leather here and there, but for raw Fel Scales farming, it beat all of the other places mentioned here that I tried. Maybe I just got lucky on the statistical memory timer! I got a number of these while farming Dampscale Basilisks in Terrokar for the eyes needed to switch from Aldor rep to Scryer. As Alliance, these and the eyes both sell for large amounts on my server making the farming of the Basilisks a good money maker. Killing ravagers in eastern Hellfire Peninsula is the way to do it. Out of all the mobs that drop these, these mobs are the closest together. (this is after trying most of the other mobs) Took about 40 mins to get the 28 needed to get from 340 to 350 lw. Combination Thornfang and Quillfang ravagers (mostly Thornfang) in eastern HFP, for my 85 cat druid, yielded 40 Fel Scales in about 45 minutes. Hit Quillfang first, then moved over to Thornfang and did a couple of circles around the spawns. That's what yielded the most Scales between the two. Minus my Guild's Bountiful Bags perk, about 29 scales in 45 minutes. Prolly just got lucky, but I won't complain. Hands Down the best place to farm is along the edge of The Dead Mire in Zangermarsh killing Топотун болотного камня and Болотный зуболиск. Tried farming in both Hellfire and Terrokar and the drop rate was terribad. 39 scales in 20 min, spanked. Note: The respawn rate isn't high enough for continuous kills, so better do it along with other gathering professions. Note: The boars appear more in abundance near both Forge Camps, those in the middle area (Skyguard and Ogri'la sites) are more scattered. Give and take some luck, I'd say the rate of getting Скверночешуя is not too different from both sites. However, one may have other consideration regarding other materials. I'll attempt to update and add more sites if time permits. Site suggestion welcome. The best place to farm Fel Scales is Dead Mire's edge. Plenty of mobs (Marshrock Stompers), and a nice respawn rate. Make a complete circuit of the outer edge, and they will have respawned at the beginning. Best place that I've found was in Blade's Edge killing the Scalded Basilisk, 1-2 from every other. The biggest problem is not as many spawn, but the ones that do the chance of the having it seems good. For anyone that is leveling LW and finds themselves needing Fel Scales to push to 350. I suggest going to Blade's Mountain and killing Камнекожий вепрь. They have the best drop rate and there are a good amount of them. Decided to farm Скверночешуя since the AH showed zero and I needed exactly one. Yes, just one. I have played a hunter with Leatherworking/Skinning since classic wow and Fel Scales have usually been a pain (introduced in Burning Crusade) to get with servers being busier when these scales were in demand. Some of the above posts had good locations and drop rate information and I dreaded having to go farm for just one. My preferred spot used to be way north of Tuurem, the Ravager shelf in Terrokar Forrest. This place was added for the Shattered Sun Offensive dailies later in the Burning Crusade expansion. My recollection of the drop rates there was bad, in the neighborhood of maybe 4 in an hour. I decided to try the Топотун болотного камня and Болотный зуболиск in the very north of the Dread Mire in north east Zangarmarsh, as suggested by some above posts. After skinning 21 Quillfang Skitterer and 12 Quillfang Ravager I got 33 Knothide Leather Scraps, 1 Knothide leather, 5 Crystal Infused Leather and only 1 Fel Scale. I went to that lovely garden spot, Northern Dead Zone in Zangarmarsh, thinking how easy it would be to snare 1 lousy fel scale. Not a basilisk was left standing, I assure you. But although I came away with a ton of knothide leather and scraps, not ONE fel scale. Disgusted, I abandoned my project and considered doing something more fun, like having a couple of root canals. I read through the comments and figured I would check out the Dead Mire spot since some people have had good luck in the past. Every xpack seems to change drop rates but I can say that the sloped shelf with the Marshrocks is good. I did a single pass through the area and picked up 10 scales along with some crystal infused. I didn't track how long it took me but everything was one/two shot in short order. Thought an updated post might prove helpful. Not sure about other places, but the Dead Mire in Zangarmarsh does drop a reasonable amount, however it doesn't appear to be as "fruitful" as others may have led. I farmed exactly three full loops (approx 45 min). They seem to drop every 6 - 8 kills. I have 28 scales, 19 crystal infused, 16 knothide, 64 knothide scraps, 57 chunk-o-basilisk and 99 claws. I have no idea why AH deposit is so high. I posted 1 stack of 5, 35g.